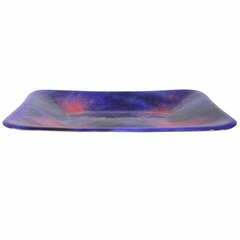 Beautiful Fornasetti serving tray featuring a vegetable design. Label on the back. Perfectly restored. 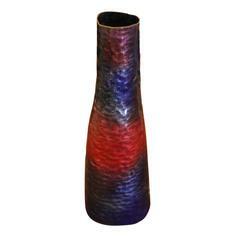 Colorful red, blue and purple enamel vase made by Paolo De Poli. Signed on the bottom. Enameled Mid-Century vase. Unmarked. Condition: Excellent vintage condition, minor wear consistent with age and use Measures: Diameter 7” Height 13.5”. Rich red with blue enameled bowl with figured surface from the workshop of Paolo DePoli and designed by Gio Ponti. Signed DePoli to base. Dreamy and Italian. Wonderful colors. Signed [P. DE POLI MADE IN ITALY]. Beautiful coral colored enamel over copper low bowl with pearlized interior, designed and executed by Paolo De Poli, circa 1950s. Signed with sterling silver plaque. 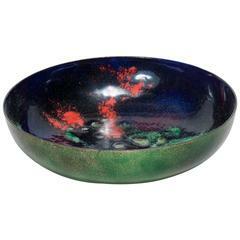 Large green enameled bowl with deep blue interior and red decoration designed by Paolo De Poli. Signed. 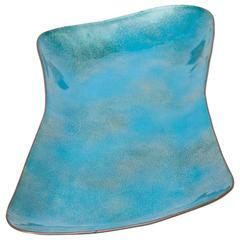 Large blue enameled bowl with deep blue interior and red decoration at the edges. Designed by Paolo De Poli. Signed. Acquired from Patrick Parrish Gallery.